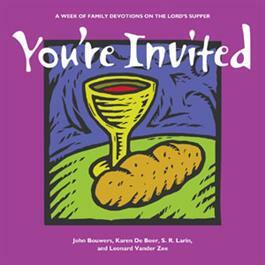 This one-week devotional helps parents or caretakers explain what the Lord's Supper is all about, get children ready to participate, and encourage the whole family to respond in gratitude for this very special gift from God. Bulk discounts are available and pricing will be updated in the cart for quantities of 10+ copies. This one-week devotional helps parents or caretakers explain what communion is all about, get children ready to participate, and encourage the whole family to respond in gratitude for this very special gift from God. Includes five readings, plus sections titled "A Closer Look" that give more in-depth information for families with older children and teens. Karen DeBoer is an early childhood educator, a curriculum editor, and a storyteller. She's been involved in children's ministry for more than 25 years. She mixes a practical approach to Christian parenting with humor and insights gleaned from her experiences as a mother of four. John Bouwers describes himself as someone who is trying to live the gospel in Milton, Ontario where he is a church planter with Crosstowne--a movement that connects the people of Milton to build a new kind of city and a new kind of church. S. R. Larin is a private educator and tutor and a member of Meadowlands Fellowship Christian Reformed Church in Ancaster, Ontario.